3.5 minutes read. Here is a guaranteed path to develop your mindset by working on conquering the stress in your life. As a result of this quote, it gives us a fantastic opportunity to reframe the meaning of stress. If you didn’t care you wouldn’t get ‘stressed.’ And, if you had no stress at all, ever, you would have apathy. Moreover, the feeling that comes with apathy is depression. And really, who wants this? This definition reframes stress. If you didn’t care, you wouldn’t get stressed. If you had no stress, ever, you would have apathy. The feeling that comes with apathy is depression. Who wants this? Now, doesn’t that put a different slant on ‘stress?’ When you see stress differently, you shift your perspective and create a new mindset for success. So, if stress is a mental or emotional strain, it’s fuelled by how we think and how we feel. How much we ruminate on it and play it over and over in our minds. Emotional strain means we will feel uncomfortableness in our body, which may escalate to intense physical reactions. We feel stress. As humans, our emotions drive us. The result can cause failure, poor behaviours, habits and upsetting others. So, how can you improve your mindset? In our busy, fast-paced worlds, we use stress in many contexts and lumped together in one big bucket of stress. From minor irritants to stressful events, such as death, illness, natural disasters, man-made disasters, and loss of a job. Here is a powerful way to better manage and conquer an overload of stress you may be experiencing. It will help you improve your mindset. First, imagine a line or continuum of stress. Next, draw a line across a page. On the left-hand side are severe stressors, what we might call traumatic events. In the middle are the things that add to your stress levels. Things and activities of daily life. Deadlines at work, minor ailments, juggling schedules, kids and activities. Then, the tasks related to daily living, such as cooking, cleaning and organising the household. Running the kids around, making dinner for the family and household tasks. Finally, the time you waste trying to find things in a disorganised household. On the far right are what we call ‘irritants.’ These include poor drivers, poor service such as getting the wrong coffee in a takeaway and only realising when you are five minutes away. Waiting in a queue, being on hold to a service provider or waiting for an appointment is also in this list. The next step is to write down all your stressors into the appropriate space on the continuum line. This helps distil truly stressful events from irritants and stressors in everyday life. Being able to distinguish things that are important to you to those that aren’t is key. It will help identify situations you can control and those you can’t. Moreover, doing this will help you see things from a different perspective and determine ways to handle your life better. Anything on the far left, severe stressors need time, care, support and sometimes professional help. The things on the far left, your ‘irritants’ you can simply choose to let go. These things when considered probably don’t have much significance in your life, do they? Do they impact your goals, values and desires? However, I bet you get really frustrated and worked up over them. Take a few breaths, realise they are quite insignificant and outside your control. Choose instead to breathe in calm and release your stress. This will free up much energy and help you feel lighter and more in control. First, could you take a few minutes to get more organised in managing your tasks or juggling kids, drop-offs and leisure commitments? Next, how about scheduling a time to tidy up, make a plan, ditch or delegate some stuff? If these aren’t possible or relevant, could change the story you tell yourself about why and how this thing is stressing you out? Try creating a new meaning that helps you see the situation differently and helps you feel better! One of the greatest gifts that humans have is our ability to choose one or more unique meanings from our experiences. There is always another way to view something, and when you see things differently you are learning how to improve your mindset and learning more about what a mindset for success is. Lastly, if appropriate to the situation, simply laugh about it and make light of it. Moreover, decide to have a bit of fun instead. Probably the best stress diffuser available and one of the very best ways to improve your mindset. You can’t hold onto two opposing emotions at once. According to Ben Tal Shahar in his book ‘Happier,’ the two foundations of happiness are meaning and pleasure. As a result, the above strategy will help you improve your mindset and overall success in life. 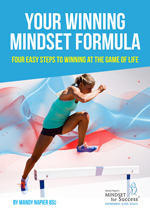 Finally, they also hold the keys to creating a champion mindset for skyrocketing your results. In conclusion, next time you feel ‘stressed’, stop and use the above method to help you reframe, release and relieve yourself of much-imposed pressure, overthinking, ruminating and wasted energy. I guarantee this will help improve your wellbeing, health, relationships, productivity and improve your mindset. Ultimately to live a happier life. Remember your mindset is a set of attitudes and beliefs you hold about life. Above all, when you improve this, you have the ultimate keys for freeing yourself from stress and living a healthier, happier and more meaningful life. And I am sure that has to be a good thing in this distracted, stressed and busy world. What causes you to feel stressed and how do you manage your stress? What strategies do you use to improve your mindset? I would love to know.